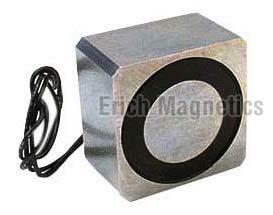 Owing to our rich industry experience, we are counted among the preeminent Manufacturers, Suppliers and Exporters of Rectangular Lifting Electromagnets from Delhi. The Rectangular Lifting Electromagnets we make available are manufactured in adherence with set industrial norms. We maintain a large stock of the Lifting Electromagnets in our spacious warehouse, to cater the bulk and urgent requirements of the buyers. One can obtain the Magnets at nominal rates. Range of sizes from diameter 25mm to 145mm. and 6, 12, 24 and 48 V DC.